Compare to Uline S-1325 and Save! 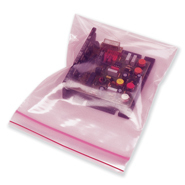 These 6" x 8" 4-Mil anti static pink reclosable bags are ideal for regular duty packaging applications where electricity can damage electronic parts, circuit boards and other devices. These reclosable 6 x 8 .004 mil Minigrip anti-stat bags feature impressive clarity, durability, and make storage and organization simple using the reclosing zipper top. These 6 in. x 8 in.4mil reclosable poly anti static bags diffuse charges of static electricity (up to 5,000 volts) within two seconds. Meets the requirements of MIL-PRF-81705D, Type II and EIA Standard 541, Packaging Material Standards for ESD (Electrostatic Discharge) Sensitive Items, have been verified by testing.